Still under license to HMV, but the black label small Nipper. 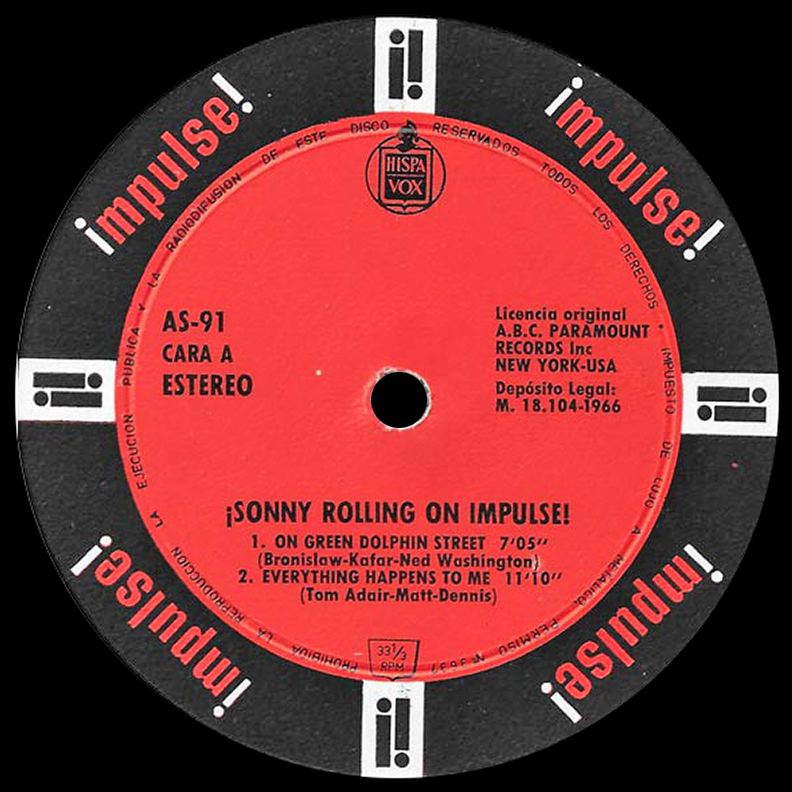 2.3 Seventies Impulse – UK direct release by Impulse no longer needing a licensee. Anyone got any info on German pressings? 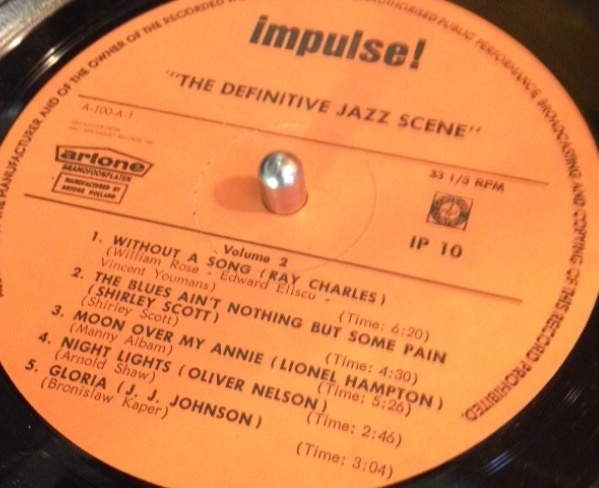 I’ve got a Coltrane’s Live At Birdland that has “Made in Germany” stamped in dead wax. It also says Am-Par, not Abc Paramount on thr label. What’s the story behind this? The sleeve is same as -64 US. There were a couple of hundred US military bases around Germany at this time, must have been some jazz fans among them, surprised we don’t see more. It is not unknown for overseas licensees to have out of date corporate identities with their printer. A photo of the label would be helpful. I made the contribution immediately as I got hold of the record as I couldn’t find any info of it. Fast work! Retouched and uploaded to the Impulse In Europe page, thanks. I am currently staying over in Barcelona and have just picked up a Spanish Impulse pressing. Cover is gatefold US origin but vinyl is ‘under licence’ and on Hispavox without RVG etc in deadwax. A-52 mono Salt and Pepper, Sonny Stitt and Paul Gonsalves. €10, hola! Do you know if this is a Frankenstein copy? i.e. a mismatched sleeve/record combination? Or were the Spanish pressings purposefully paired with US sleeves? Impulse/ Hispavox label uploaded. Thanks for the tip-off, not seen this one before. Hola, Estereo! later french Impulse! 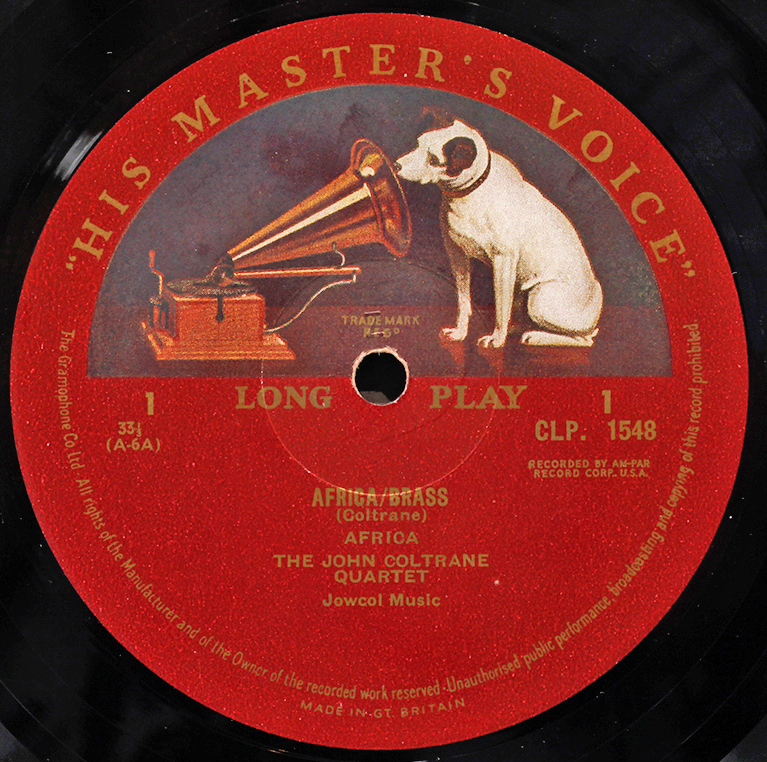 (not Vega) pressings were made by Pathe Marconi with imported sleeves. Much more better than late(after 1971) US reissues in my oppinion. The Vega and Pathé Marconi pressings were both excellent and certainly beat later US versions. I think it sounds very lively. Ok I misunderstood your comment. 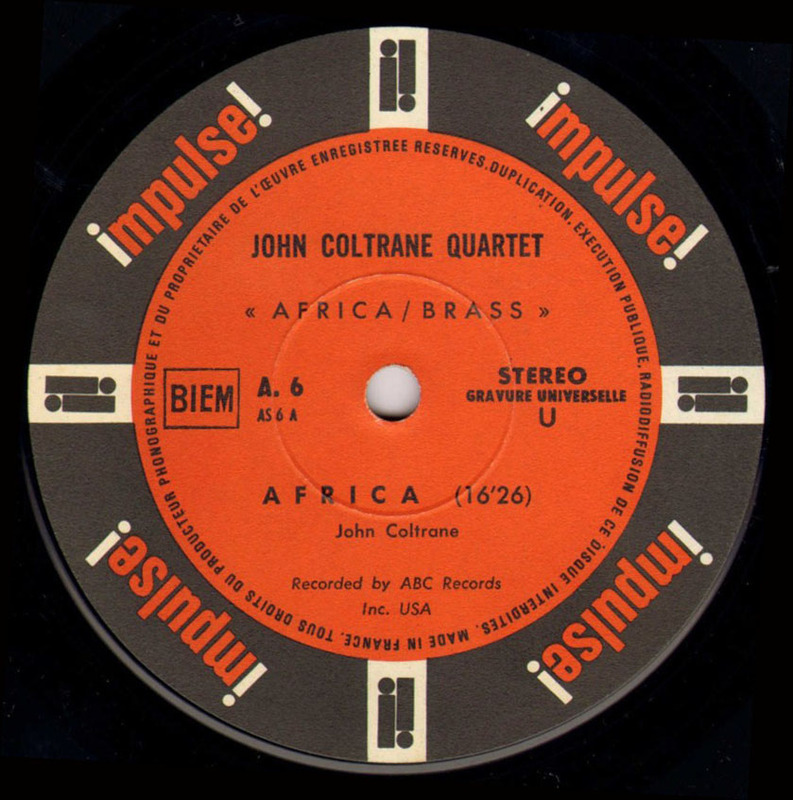 It could be that Africa Brass is the only Impulse issued by La Voce and with that label. I was lucky to find a NM copy of this one, it’s a fully laminated (not gatefold) cover and thick vinyl. Regarding LJC’s question whether this french Impulse is from imported stampers or locally made, I can only give an answer for my Véga pressing: it has A 35 1 printed in the dead wax, nothing else. My american pressing of same has AS 35 hand-etched and RVG and stereo printed. Thus the Véga looks to have been made from a french master. The sound of this album is very good, the top. I acquired a VEGA pressing of Impulse 35. It is not G.U. (gravure universelle, i.e. mono/stereo), like the one shown hereinabove from the french seller, but a real monaural issue. Orange/black labels, in small characters “production vega”, BIEM and a circular text in white characters. The cover is a soft flip over cover with a french text, unlike the imported US fold-out cover with English text of my former AS-121, which had a gold G.U. sticker on it. Today I saw an Italian pressing of Blues and Abstract Truth at my LBS (with the label as shown above) which had the RVG stamp in the deadwax. Any experience of this? I passed on it but may go back – after all an original is not going to be cheap – it was in excellent condition as well. My LRS I should say – mixing up my hobbies there! Yes., it exists. Astonishingly, it seems Impulse sent RVG-originating metalwork to press this title in Italy, the same production model as was used between Prestige and Esquire. I have listened to said title on Italian Impulse obtained by a friend, and I can confirm it is the real deal. Well, solid advice as ever LJC. I returned to pick this up and I am most pleased. Despite the large scale orchestration the mono is surprisingly good on this edition and the music emerges from a black background on pretty much excellent grade vinyl. As fate would have it, I also discovered, on the same return visit to my shop, an earlier red-ring Impulse! label pressing and Van Gelder Stereo-stamped edition of Gil Evans’ Out of the Cool for a tenner. The vinyl was a bit noisier and the Italian pressing compared very well. I’ve never seen such pressings, neither one in my life. I’ve been collecting Impulse since 1968: at the time all were original USA issues, distributed by La Voce del Padrone (italian for HMV). first years of label may have been printed under license. “disco infrangibile” means unbreakable record. 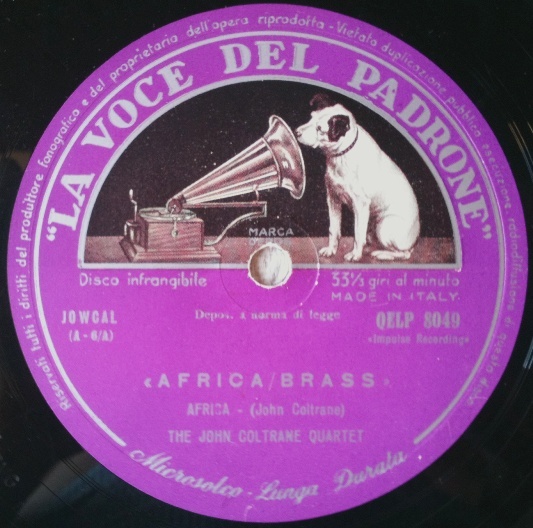 If you look carefully you can see part of the RVG stamp in the deadwax of the label of Africa Brass shown above – right in the bottom left hand corner. hi Luciano: I don’t know. as I wrote, I’ve never seen an Italian issue. 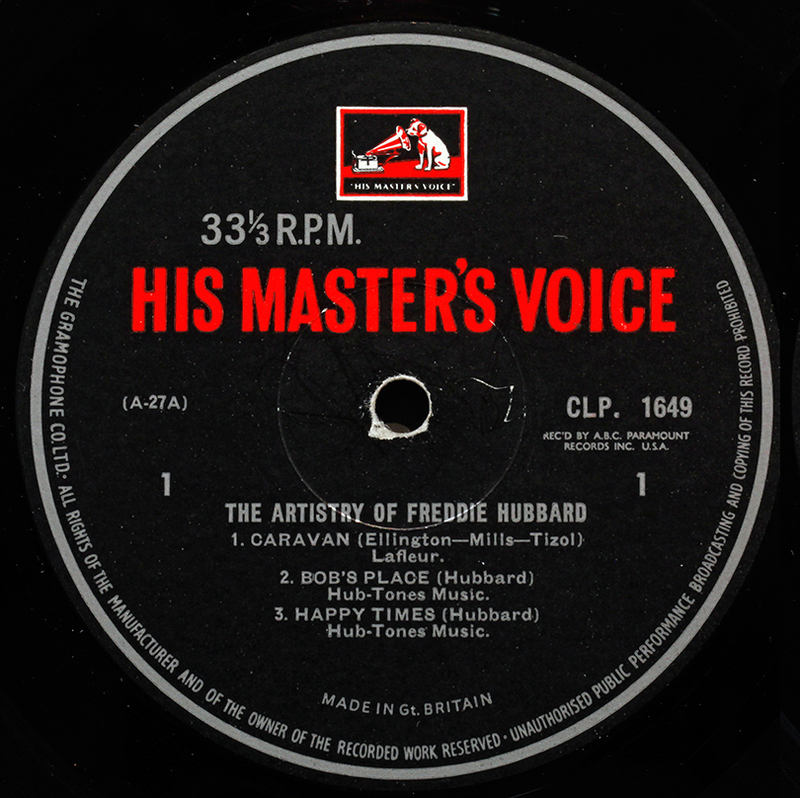 the whole USA catalogue was widely distributed since the first numbers and was easily available in record shops. as originals had a greater appeal (album covers), I don’t think many numbers were pressed. Found one few days ago I will listen to it and will let you know. French Impulse are not US metalwork like Prestige. They are remastered by local engineers from copy tape. Frankly they vary from title to title, some good, some indifferent. If you want to be sure what you are getting, there is no substitute for Impulse RVG/VAN GELDER original US. sad but an expensive fact of life. 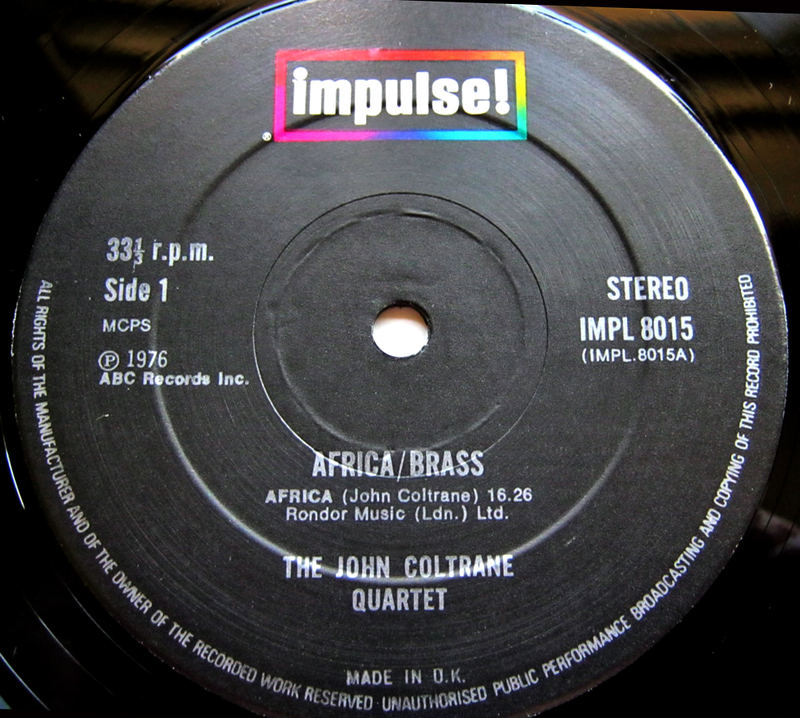 renaissance of a buried thread: are french impulse from the sixties “rebadged” u.s or genuine french pressings? some say Pathé plants managed it but used imported/printed u.s sleeve covers. I saw a french Impulse issued by VEGA, orange/black label though. No chance to listen to it. I have had a french pressing Impulse (BIEM) orange/black labels with an imported US foldout sleeve (AS-121), laminated. I traded it for an original US pressing.